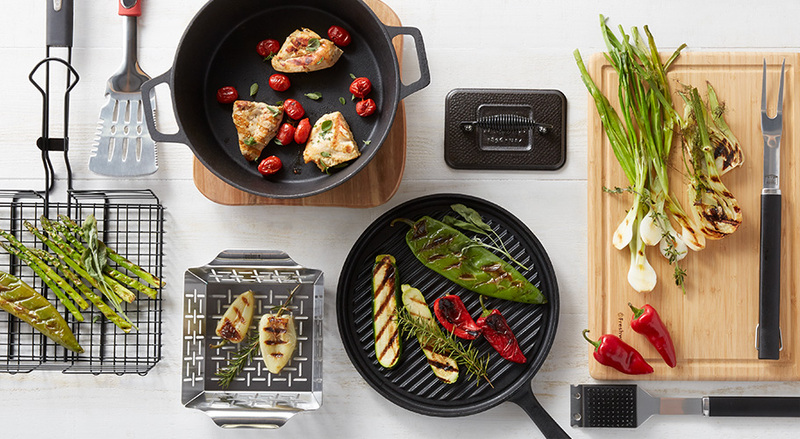 The right grill makes it easy to whip up everything from appetizers to desserts. Shop our wide selection of brands, models & tools to make entertaining a breeze & then gather your friends for a meal under the stars. Cool weather can’t stop the grilling. Get the tools to create healthy, flavorful meals outdoors & then enjoy them in your cozy kitchen. With spring produce on its way, now is the time to start practicing your grill game. No backyard gathering or outdoor party seems complete without someone broiling and barbecuing up some tasty meat and veggies. The grill becomes a focal point of the event, rather than something that just provides sustenance. Everything from steaks, hamburgers and shrimp to eggplant, portobello mushrooms and peaches is great on a grill. 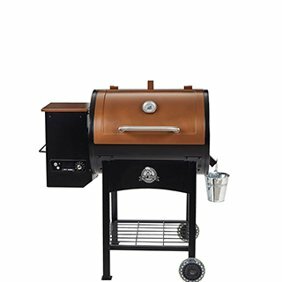 There are several types of grills from which to choose, and you can also find all the accessories you need to get the most from your grill. Our Every Day Low Prices make it possible to enjoy an outdoor grilling experience you may have only dreamed of. To begin, there are four types of grills: gas grills, charcoal grills, electric grills and smoker grills. The first three operate on different types of heat sources, and smoker grills can be gas, charcoal or electric. Gas grills Gas grills are one of two types: liquid propane or natural gas. Liquid propane grills run on either small or large tanks of liquid propane, depending on the size of the grill. 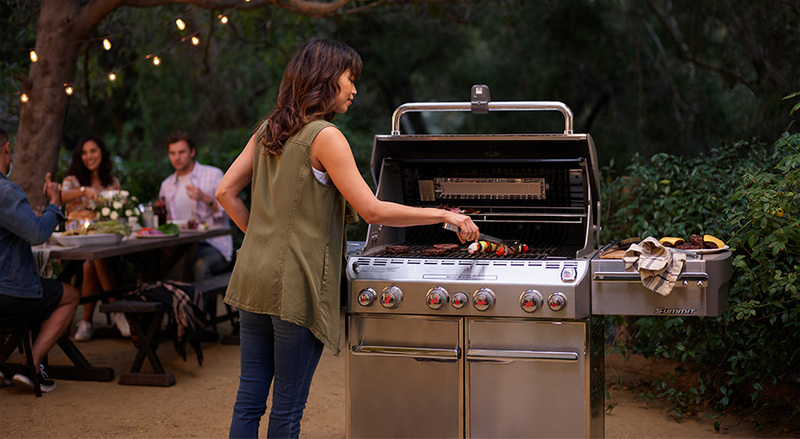 Natural gas grills connect to a gas line that comes from the home. Although there are large, stationary propane grills, many of these gas grills are portable, making it possible to use when tailgating at the game, at the beach or at a park. Portable ones are usually square or rectangular and have one grill rack and one burner. 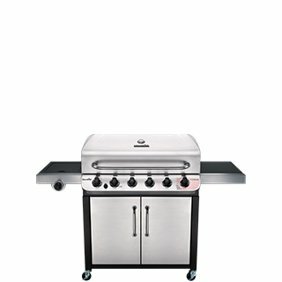 Freestanding gas grills have between two and five burners and racks. Larger grills usually have at least one side table and sometimes a burner for cooking with a pan or skillet. 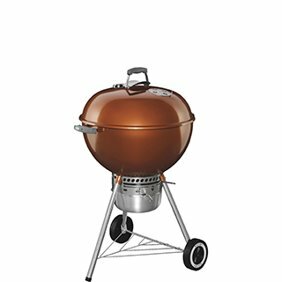 Even large grills are slightly portable; many have two or four wheels. Charcoal grills Charcoal grills are smaller grills that use charcoal briquettes that you light with either lit paper or by soaking the briquettes in lighter fluid. You mound the charcoal briquettes in the center of the grill or on one side (allowing for a hot side and a cooler side to prevent flare-ups). A chimney starter is a terrific way to set up the briquettes. Charcoal grills take many different shapes, including flat, domed or egg-shaped. There are vents on the top and the bottom of the grill to regulate the amount of air that passes through the grill and allow you to control the heat being produced. 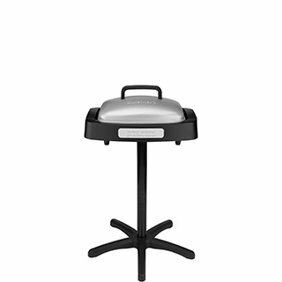 Electric grills Electric grills are small grills that plug into an electric socket. They can either stand on legs or work on a tabletop. Some have reservoirs that allow fat to drain off, making the foods less fattening. Smoker grills Smoker grills can be heated by any of the power sources. 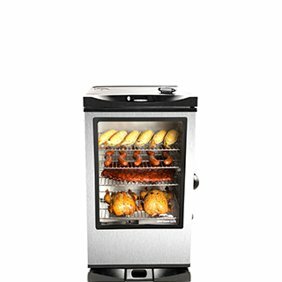 These grills operate at lower temperatures and use wood chunks, chips or pellets (made from compressed sawdust) to produce smoke that both cooks and flavors the food. Large versions of these smokers have a separate smoker box for put the wood products in and are barrel-shaped with a chimney on one end. Essential grill tools include tongs, spatula, fork and grill brush. Other pieces to consider include a knife (some spatulas have sharp edges and work just like a knife), sauce brush or mop and skewers. These pieces are sold individually or available as part of a kit. Keeping the grill clean is essential for preserving the natural flavor of the foods you're grilling. Grill brushes are wire bristle brushes that scrape the grates clean of debris and cooked-on or burnt-on foods. It's best to use the brush while the grill is still warm, either after grilling or before grilling the next time. Season the grill after cleaning it by wiping with paper towels, then coating the grates lightly with oil. Another essential tool to have is an instant-read thermometer. These allow you to immediately find out the temperature of the food you're cooking. They're available in many assorted styles, including large forks that have the temperature probes in the tines. To protect the grill, a cover is essential. This protects the grill from inclement weather and prevents rusting. Fryers These are gas-powered deep fryers commonly known as turkey fryers that you fill with cooking oil and fry foods, most often a turkey. Many of these also allow you to fill them with water rather than oil and use them to boil large amounts of food, such as for a seafood boil. Pizza oven For those with some space in their backyard or patio and who love to make pizza, an outdoor pizza oven may be something to consider. Most of these ovens are wood-fired, allowing you to make pizza the way they do in pizza restaurants. Burners for grills that don't have side burners for pots or skillets, portable burners are an option. These can rest on any flat surface, such as a grill's side table. They can be propane-fired or plugged into an electrical outlet.